A JMV’s Copper Bonded Grounding Rods (Copper Claded Rods) is a product that helps in dissipating the fault current to help your assets being damaged from the hazards of fault current. The copper clad rods are molecularly bonded with 99.99% pure Electrolytic Copper (Cu) over a low carbon tensile steel rod, with the thickness of 250 micron copper coating. The low carbon tensile steel comply with BS 970 & AISI 1018 that has great capacity of being stretched or extended at least up to 600 N/mm2. The steel rods are extremely opposed to oxidization and add a lot of strength & longevity to grounding system. 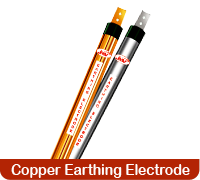 The copper used in the earthing rods conform to BS 4360 grade 43A. Each earth rod is treated with advanced technologies to prevent oxidation of copper bonding. For effective use in the extreme soil condition such as high salt or moisture content, the copper provides high corrosion resistance and exceptionally long life to the steel rods. The copper layer is bonded to steel core through an electrolytic process that ensures a perfect and tough bonding between the steel and the copper.